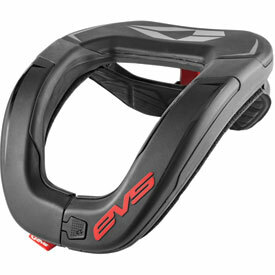 The EVS R4 Neck Support is a neck brace that prizes comfort, mobility, and price, while still retaining all the safety of higher tiered options. With the R4 you get protection against hyperflexion, hyperextension, and lateral hyperflexion while remaining comfortable thanks to features like the easy front entry system, rubberized edges, and fully adjustable strap sizing system. The brace is also extremely lightweight, so you’ll hardly notice it’s there until you need it during a crash. Make the EVS R4 Neck Support part of your riding gear and you’ll take a big step towards avoiding injury and staying healthy for a lifetime of riding. Recommended for 5'3" +, 105 + lbs. This neck brace is the only one I have ever owned (other than the foam donut) so I don't have a lot to compare to. It took a little getting used to, but now I don't mind it and have a little extra comfort in the belief that this would help in the event of a crash. Jerseys don't easily fit over it also. Honestly, this isn't for me personally. It limited my movement and just wasn't comfortable. Ymmv, but as for me, it's a solid no. Give it a try and send it back if you don't like it. I will be ordering one of the leatt neck braces to try out instead. Would suggest it to anyone! Awesome collar for the price! Fits great , suggest a roost guard to go with can be tricky with certain chest protectors but their are alot out there that it will work with. Would suggest to any one who doesn't want to spend unnecessary amounts of $$$. Fast shipping as always love buying from Rocky Mountain! Fits great, straps that come to fit and hold better on your body work great as well. I like this neck brace. I have a really bad neck and needed something and this fits the bill. Fits good, stays in place, and is comfortable. I have crashed with this at least 10 times in enduro and trail riding. Solid protection and prevents helmet overroverrotation as advertised. Great product. Stay secure when riding abd fits great. Cheap insurance for your neck. You dont even know its there! Comfortable, durable and light weight you don't even feel your wearing it. This brace works. It did for me. Bad crash. Concussion, broken hip & pelvis, broken tibia, fractures in L2-6. Two cracks in my Fox V3 helmet. Neck came out just fine. Mine is 4 years old now. Still cleans up good & works as well as the day I bought it. I never ride without it & every time I wear it I forget its there. Very durable. What more can you ask for? Extremely light weight. very comfortable. work very well with any helmet. awesome price. This is a purchase you want to make but never use. if I fall, i know EVS will save my neck!!!!!!! good value. I would recommend for all dirt riding. Only neck brace I've ever worn but it's comfortable and affordable. Haven't had a chance to test it out yet and hopefully won't have to. I am very Satisfied with this Neck Support Highly recommend. Mainly bought this due to the price, great alternative to some of the other braces that are $600 or more. After having it for some time I'm happy with it, does its job is comfortable and affordable. Easy to use and sturdy just a great important piece that many for get and a really good price! I ride hard, I crash a lot, lol. My neck is still somewhat intact! This neck support workS!!! BRRRRRAAPPPP! I never thought I would find a brace comfortable and light enough for me to actually enjoy wearing. I have used this brace for several seasons now and it is holding up fairly well. My only recommendation for improvement is that it may benefit from more cushioning/padding but it cannot be beaten for the price. i've crashed a few times wearing this neck brace. my wrecks weren't severe but for the price and how it works i'm glad i bought it. i used an under the jersey chest protector or a over the jersey deflector with this neck brace and they both wear comfortable. so the product discription is do what it says with the other product brands i use. It's a great neck brace for the price. Not top of the line, but it will do the job. I like the strap system that comes with it to hold it in place too. Nice! Won't ride with out it! Front clasp broke along with collar bone. Rode with this brace for 2 years. Comfortable and light weight but like 2 other reviewers I too broke my collar bone (better than my neck!) and in the same crash the front clasp broke. I will probably not go with this brace again. With this being being said, crash would have been worse had I not been wearing it. This brace is very light and comfortable. Have worn it every time I rode for the past couple of years. It protected my neck in every crash. On my last fall, which was a low speed tipover, it did protect my neck but I ended up breaking my collarbone. Feel that with this brace resting on the bone added to the fact that it broke. The extra couple hundred bucks for a brace that doesn't rest on the collarbone doesn't even come close to the cost of surgery to plate my bone. This brace is great. Comfy and safe at a great price point. What more do you need? A VERY GOOD PRODUCT! DOES WHAT IT'S SUPPOSED TO DO! I'VE HIT THE GROUND A FEW TIMES WITH THIS AND I'M GLAD I WAS WEARING IT. I have used several neck braces and this is my favorite. It is inexpensive. Light weight. Also it does not hinder head rotation. Real neck braces are supported on your shoulder blades and your front upper chest. This one sits all the way around. If you fall sideways all the force goes to your colar bone where it meets your shoulder. Broke my colar bone in a minor spill last weekend with this cheap thing. Your neck is worth more protection than this provides. Fantastic, very easy to put on and take off. When you first take it out of the box it has a strong plastic/chemical odor. After a week or two that goes away and this neck support works. My son has had a few hard crashes at the track and has not had any neck issues from them. Will and have recommended to friends. About 4 motos. No problems, not restrictive at all. The neck brace is great. The front clip broke after a few rides but better than my neck. This seems to be a great neck brace, thankfully i haven`t had to find out if it would save my life or not, but it fits great. Works good has got straps to hold it in place but are a pain to take on and off i use it without them it moves around a little but still good. Great fit, comfy and cant beat the price. Husband wears it all the time, doesn't bother him a bit. He wanted something to protect his neck but didn't want to spend hundreds of dollars. Not flashy, but does it's job. Got one for our 5 year old as well, no problems on the kid sized one. High quality protection at 1/4 of the price. i was unsure about the quality, at first, of the neck brace due to the price, but soon was proven wrong. i have taken many bad falls with this brace (flew over bars once) and each time never had any neck injuries. The most recent crash i slammed my shoulder and head on the ground breaking my gopro mount. this neckbrace saved me from any further injuries. would recommend this to anyone needing good protection riding trails or racing. I purchased this neck brace due to my budget getting low and it fits great, it includes a strap kit to keep it held down on your shoulders which I was unaware of until I received it, but it feels great to have on. The brace is very lightweight and you will barely notice it on when riding. I find it comfortable to ride in the woods with along with wearing on a motocross track, and the included straps keep it from bouncing around. I read a lot of complaints about how its hard to get off, but I set down and messed with a while and figured out exactly how the front latch works and once you figure that out it a breeze to get off. Great neck brace for the price so far, but I haven't had any bad crashes with it on yet neither so only time will tell. However I would suggest it to anyone on a budget. Whether your just riding or racing you can not replace a broken neck. I'd advise everyone to wear a neck brace like this. Last year I purchased this braced and I admit I was skeptical due to the low cost. I was riding at Jordan River OHV park in Salt Lake and hadf a nasty get off and landed square on my head. Broke my visor off, cracked my helmet and wound up with a concussion (and an $1800 ambulance ride) . No doctor told me this, but I believe my brace saved me from further injury. I am a believer. Took a pretty Knarly fall yesterday... landed on the side of my head hard enough that my GoPro mount and all flew off my helmet... I'm pretty sure the only reason I got up from that crash is because I was wearing this neck support... Highly reccomended because of its support and how cheap it is! My wife likes hers we got her the youth size, mine doesn't fit very well with my helmet and roost guard, its great without the roost. I will most likely buy something else soon. Bought this cause cheaper than other brands and didn't rub my shoulders like others. Only reason I gave it 3 stars is it seemed to push my helmet up in the back in turn pushing my goggles over my nose. I wear a fly carbon dragon helmet, not sure if it would be better with other brands of helmets. This is a budget version of the Leatt and other top (overly priced, in my opinion) neck rolls/braces, it fits great with or without a chest protector underneath. I have tried foam neck rolls that ziptie straight to your chest protector and I actually notice this product less, it's very light and roomy. Velcro has held up for about a year now and it's been washed and covered in muddy water plenty of times. Don't let the looks fool you. I bought this neck brace because, 1) I'm cheap, 2) It's the least expensive "real" neck support 3) I'd never worn one and wasn't sure I'd like wearing a neck support at all. It is really quite a clever and stout design and build. The support goes down the back, and sticks out behind to support the back of the helmet, just like the best of 'em. Made of hard Bio-Foam with some solid core for shape, with a plastic molded cover. It's got comfortable padding for shoulders and collar bone. I don't even know it's there the moment I start moving. Won't ride without it now! NOT looking forward to testing it's effectiveness!!! Does this come with a harness? BEST ANSWER: Yes, it does. Fits under arms and velcros to brace. Mine came with a harness. I think they are suppose to. Usually they do, but it rides good without one. Yes it is not the best harness but it works. Yes it does. keeps it in place very well. Yes. A shoulder strap harness. Does it work with most chest protectors? BEST ANSWER: Yes, it works with most all chest protection if you adjust it properly. Will this fit with a leatt adventure lite chest protector? BEST ANSWER: My kids (I say kids but they are all man size ages 17,15,14) all have either thor or fox chest protectors, and this neck protector fits just fine. I looked at the one you referenced online and it does not look like it would be a problem. This is a great neck protector. Nicer in person than the picture even and my boys say it is comfortable as well. They really like this. Well worth the price. Yes I have them for my kids, but I would highly recommend going with one of the leatt neck braces I know they are more expensive but definitely worth it. I have the 5.5 and love it. Yes this style fits with hard plastic chest protectors and the soft under jersy one's. Unlike the high dollar one's that don't seem to fit good with any chest protectors. I have a fox racing air frame roost deflector and would like to know if this neck brace is comparable. ? BEST ANSWER: Do you mean compatible? If yes, then yes it is. It will fit with any roost deflector, my sons all have different roost deflectors and they all have this neck brace and it fits fine with all of them. 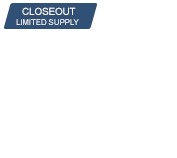 It is a great product that I highly recommend. I don't know, since I don't wear a roost deflector. I imagine it should , its not bulky and would probably rest on the deflector. Will this work with the Least 5.5 Pro HD? Will this protect my collarbone?